The early workhouse directory An Account of Several Workhouses..., published in 1725, notes the existence of workhouses at "Billerica" and Brentwood. The Billericay workhouse may have dated from as early as 1719 when parish records note that a bond for £50 was borrowed in connection with the building of a house for the poor. According to (Grounds, 1968) the workhouse stood 'not far from Sun Corner' on Laindon Road, to the south of the town, and was a three storey building with twelve rooms. Brentwood's workhouse was located on Back Street. The Shenfield workhouse stood to the north-east of Brentwood, just across the parish boundary which divided the two parishes. In 1837, the Shenfield premises were sold off by auction at the Green Dragon public house for £380. 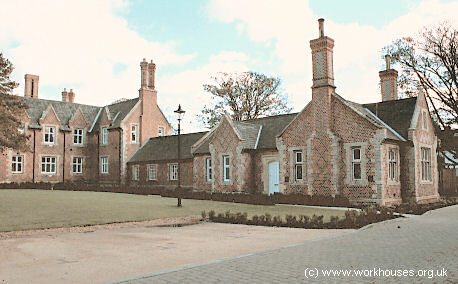 The Shen Place almshouses now occupy the site. 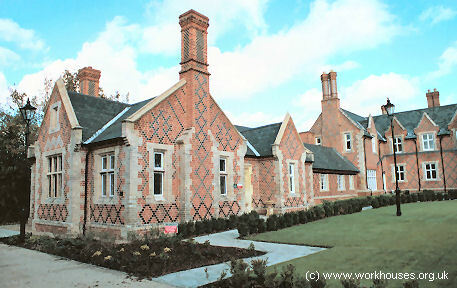 Shenfield former parish workhouse site, 1873. County of Essex: Basildon, North Benfleet, South Benfleet, Bowers Gifford, Brentwood (2), Great Burstead (2), Little Burstead, Childerditch, Downham, Dunton, East Horndon, West Horndon, Hutton, Ingrave, Laindon, Mountnessing, Nevendon, Pitsea, Ramsden Bellhouse, Ramsden Crays, Shenfield, Thundersley, Vange, Little Warley, South Weald (2), Wickford. Later Additions: Basildon, Lee Chapel (from 1858). The population falling within the Union at the 1831 census had been 12,529 — with parishes ranging in size from West Horndon (population 63) to Great Burstead (1,977). The average annual poor-rate expenditure for the period 1833-35 had been £8,559 or 13s.8d. per head of the population. 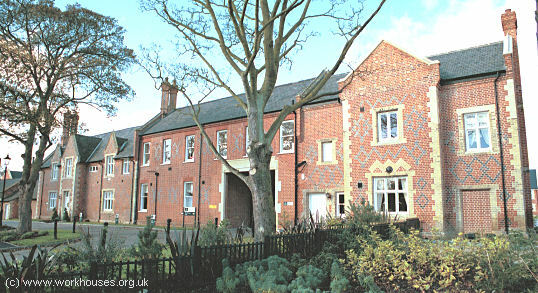 The new Billericay workhouse was built in 1839-40 on an 11½ acre site in Billericay known as Stock Hill Field, between Stock Road to the west and Norsey Road to the east. It was designed by George Gilbert Scott and William Bonython Moffatt where were the architects of many other workhouses during this period including ones for the Witham, Dunmow and Tendring Unions. Their design for Billericay was in an Elizabethan Tudor style and cost £11,000 to build. The main entrance to the site was at the south on Norsey Road where a porter's lodge was located. The main workhouse block was a large H-shaped building facing to the south. The workhouse's location and layout can be seen on the 1896 map below. The Master's quarters lay at the centre of the main block. Billericay Master's entrance from the south-west, 2000. 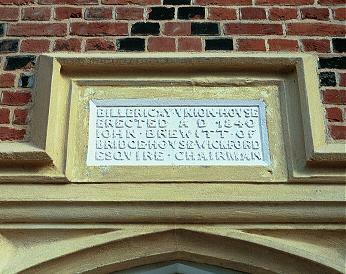 A plaque above the main entrance door reads "Billericay Union House Erected AD 1840 John Brewitt of Bridge House Wickford Equire Chairman." Billericay rear of main block from the north-east, 2000. Females were accommodated at the west of the site and males at the east, with children residing in the central and southern portion of the side-wings. The south-west wing included a nursery and receiving wards and a chapel at its far end. Billericay chapel (left), nursery, and girls' wing from the south, 2000. The Guardians' board-room was located at the southrn end of the boys' wing, opposite the chapel. Billericay board-room (right) from the south-west, 2000. The open space at the south ouf the main building was used for boys' and girls' playgrounds. The areas at northern side of the main building was used to provide "airing courts" for the adult inmates. Billericay male side from the north-east, 2000. In 1898, additional land was acquired to the north of the workhouse. 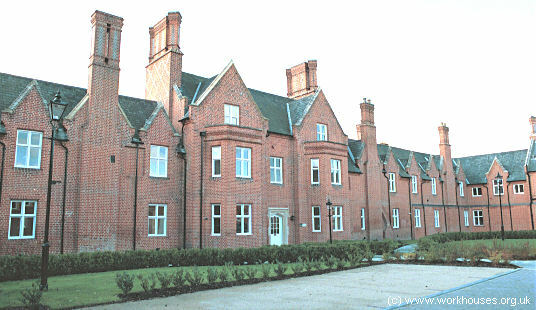 Additions included an infirmary to the north of the workhouse, and casual wards and a Labour Master's house at the north-west accessed from their own entrance on Stock Road. Further developments were a receiving ward near the main entrance in 1907, and a new infirmary at the north in 1927. The workhouse, or at least its casual ward, became known locally as "The Grubber" — presumably because it provided "grub" or food. 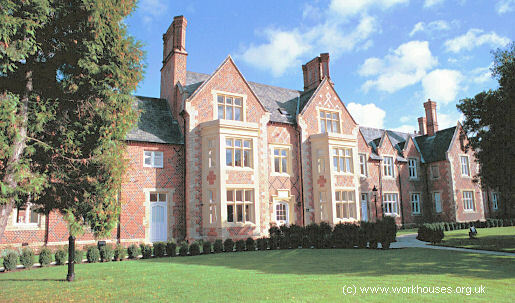 After 1930, the workhouse became Billericay Public Assistance Institution under the control of Essex County Council. The site later became St Andrew's Hospital but following its closure in 1998 has now been redeveloped for residential use. I can remember the time when a specified quantity of coke (fron the local gas works) was broken by the casuals in return for a night's "doss". When the local gas works closed coke breaking stopped and the casuals sawed and chopped old railway sleepers to make firewood. The firewood was sold locally. Before the EMS (Emrgency Medical Scheme) hospital huts were built, there was a piggery behind the "new" hospital buildings. The Essex County Council organised a "swap shop" of hospital produce. "Foxcroft", a house at 100 High High Street in Billericay, was once used by the union as a children's home. 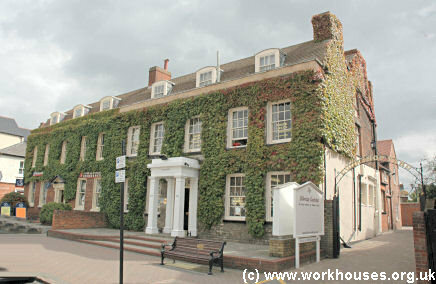 Essex Record Office, Wharf Road Chelmsford CM2 6YT. Holdings include: Guardians' minutes (1835-1915, 1920-30); Ledgers (1835-1930); etc. Jackson, QM (1983) A Brief History of St Andrew's Hospital 1840-1982.